Why Must All Fibroid Patients Be Evaluated With MRI? MRI is the imaging modality that shows the number of fibroids most correctly. In many patients, in whom ultrasound shows only one or a few fibroids, MRI may show that the patients have in fact more fibroids, and this may change the type of treatment that will be employed. With MRI, the size of the fibroids can be measured more objectively and accurately while in ultrasound these measurements are operator-dependent. The location of the fibroids (submucosal, intramural, subserosal), their connection to the uterus (pedinculated or not) and the size of the pedincule (wide or narrow) can be much more accurately demonstrated with MRI compared with ultrasound. Ultrasound is not able to show whether the fibroid is live or dead. In contrast, MRI can correctly demonstrate the viability of the fibroid; on contrast enhanced pelvic MRI, live, degenerated (partly dead) or dead fibroids can be easily differentiated. This aspect of MRI is also very useful for the evaluation of the UFE results; before the UFE, the live fibroids take up contrast and seem hyperintense (white) on MRI, just like the healthy uterine tissue. After UFE, fibroids become dead and can not take up contrast while the normal live uterine tissue does. As a result, the dead fibroids are seen as hypointense (gray-black) areas in contrast to the normal uterine tissue which is still seen hyperintense (white) as before. 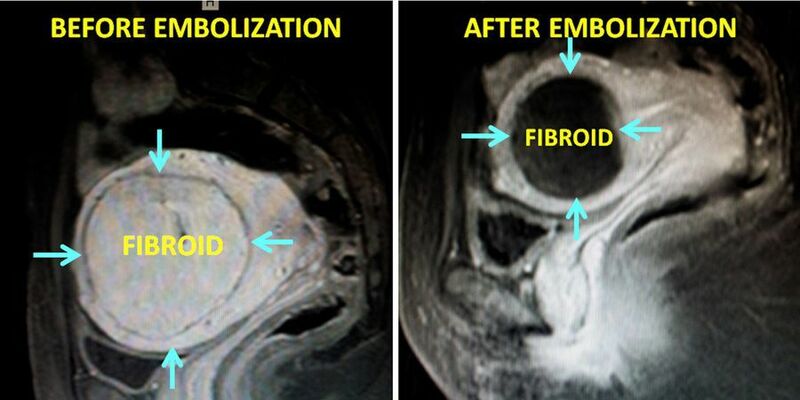 Therefore, MRI can reliably show whether the fibroids are live or dead after UFE. In conclusion, it is extremely important that all patients with fibroids should undergo an MRI examination and consult to an interventional radiologists before any therapeutic decision is made.